Avi Vantage includes support for networked hardware security module (HSM) products, including SafeNet Network HSM and Thales nShield. This article covers the SafeNet Network HSM (formerly Luna SA) integration. For Thales nShield support, see here. This article describes how to configure Avi Vantage to use the key generation and encryption/decryption services provided by SafeNet Network HSM. This enables use of SafeNet Network HSM to store keys associated with SSL/TLS resources configured on a virtual service. Avi Vantage release 16.3.2 uses SafeNet Network HSM Client Software Release 5.4.1 for 64-bit Linux. Support for HSM Version 6.2.1 was introduced in Avi Vantage release 16.5.2. Avi Vantage can be configured to support a cluster of HSM devices in high availability (HA) mode. Avi Vantage support of HSM devices requires installation of the user’s SafeNet Client Software bundle, which can be downloaded from the SafeNet/Gemalto website. By default, Avi Service Engines and Controllers use their respective management interfaces for HSM communication. On CSP, Avi Vantage release 16.3.2+ supports the use of a dedicated Service Engine data interface for HSM interaction. Also, on the CSP platform, Avi Vantage release 16.4.1+ supports the use of a dedicated Controller interface for HSM communication. 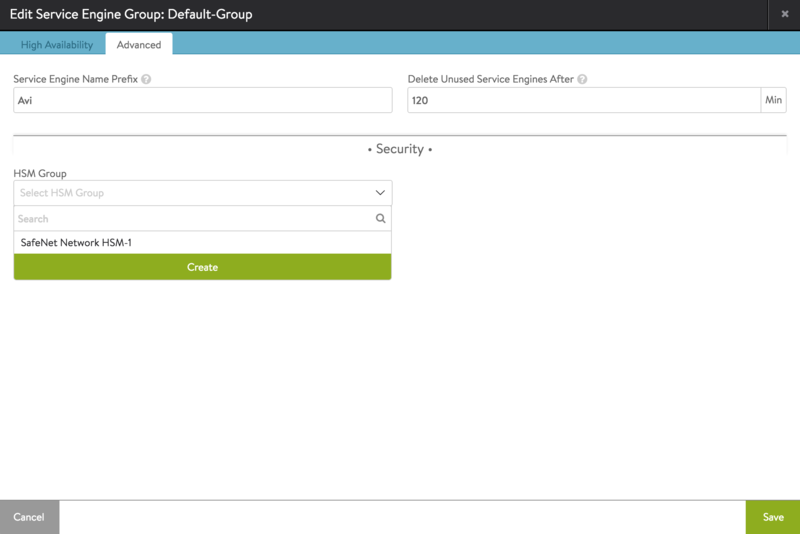 The user may choose to create the HSM group in the admin tenant with all the Service Engines spread across multiple tenants. This way, HSM can be enabled on a per-SE-group basis by attaching the HSM group to the corresponding SE group. In this mode, the configuration to choose between a dedicated interface and a management interface for HSM communication is done in the admin tenant; all other tenants are forced to use that configuration. Alternatively, as introduced in Avi Vantage version 16.5.2, the user may create HSM groups in their respective tenants. The configuration choice of a dedicated or management interface for HSM communication is determined at the tenant level. In this mode, Controller IPs can overlap in every HSM group. Internally, the certificate for these overlapping clients is created once and reused for any subsequent HSM group creation. SafeNet devices are installed on your network. SafeNet devices are reachable from the Avi Controller and Avi Service Engines. SafeNet devices must have a virtual HSM partition defined before installing the client software. Clients are associated with a unique partition on the HSM. These partitions should be pre-created on all the HSMs that will be configured in HA/non-HA mode. Also note that the password to access these partitions should be the same across the partitions on all HSM devices. Server certificates for SafeNet devices are available for creating the HSM Group in Avi for mutual authentication. 1) Have the client license from SafeNet to access the HSM. 2) Be able to reach the HSM at ports 22 and 1792 through Controller management or Controller dedicated and SE management or SE dedicated management interface. After creation, update or deletion of an HSM group requires reloading of a new SafeNet configuration, which can only be achieved by restarting the Avi SEs. Restart of Avi SEs temporarily disrupts traffic. Copy files from the downloaded software into any given directory (e.g., safenet_pkg). Change directory (cd) to that directory, and enter the cp commands as shown below. Note: This example uses HSM v5.4.1, but the same is also valid for HSM v6.2.1. HSM package can be uploaded in the web interface at Administration > Settings > Upload HSM Packages. This command uploads the packages and installs them on the Avi Controller or Avi Controllers (if clustered). If the Controller is deployed as a 3-node cluster, the command installs the packages on all 3 nodes. Upon completion of the above command, “HSM Package uploaded successfully” should appear. After using the above steps to install the SafeNet software bundle onto the Avi Controller, the Controller may be configured to secure virtual services with HSM certificates. Note: Starting with release 16.2.2, automated CSR workflow for SafeNet HSM is supported. Create the HSM group and add the HSM devices to it. Register the client with HSM devices. Set up HA across HSM devices (optional). Associate the HSM group with the SE group. Add the application certificates and keys by importing them. These are the keys and certificates generated out of band. Enable HSM support on a virtual service. The contents of these certificates are used while creating the HSM Group. 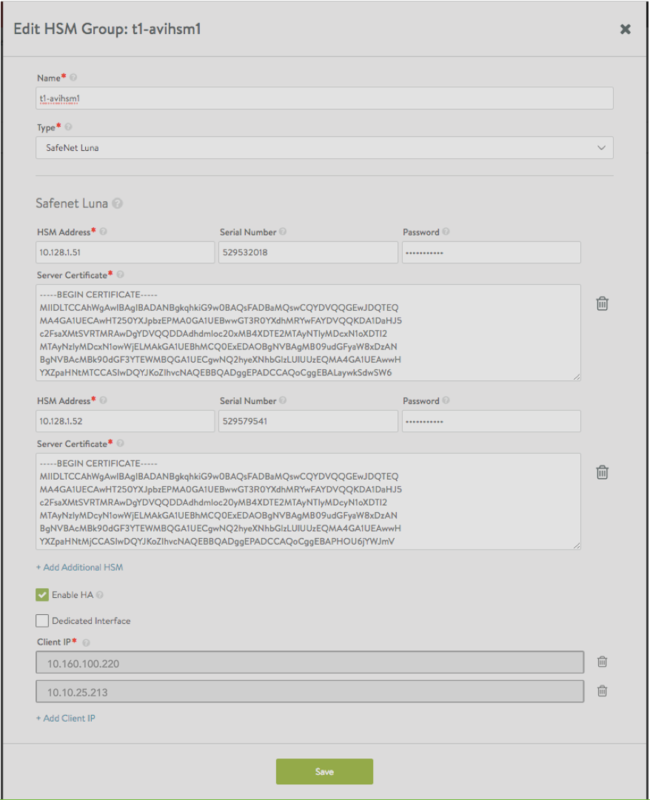 Avi Vantage supports trusted authentication for all nodes in the system. This can be done by providing IP addresses of Controller(s) and Service Engine(s) which will interact with HSM. Use the below options of the HSM Group editor. The SafeNet server certificates can also be provided by the Security team managing the SafeNet appliances. In either case, having access to these certificates is a pre-requisite to creating any HSM configuration in Avi Vantage. By default, SEs use the management network to interact with the HSM. On CSP, Avi Vantage also supports the use of a dedicated network for HSM interaction from version 16.3.2 onwards. Also, on the CSP platform, Avi Vantage versions 16.4.1 onwards support the use of a dedicated interface on the Controllers for HSM communication. Next, create the HSM group. From the GUI, switch to the desired tenant and navigate to Templates > Security > HSM Groups. Click Create and provide a suitable name and Type as “SafeNet Luna”. Provide the IP addresses of the desired SafeNet appliances and the respective server certificates obtained previously. Multiple HSMs may be included in the group via the green Add Additional HSM button. For more information on switching tenants, read the Switch Between Tenants article. The Password and partition Serial Number fields (as shown in the below screenshot of the Avi UI) can be populated if the respective HSM partition passwords are available at this stage. Otherwise, this has to be done after client registration step below. Note, if any dedicated SE or Controller interfaces have been configured for HSM communication, check the “Dedicated Interface” tick box and verify the IPs listed are those of the desired dedicated interfaces on the Service Engines and/or Controllers. The UI should allow changing the IP addresses if this is not the case. Also note that all Avi Vantage Controllers and all Service Engines associated with the SE group should have at least 1 IP address in the list to ensure access to the HSMs. This step is extremely important because SafeNet appliances will not allow communications from un-registered client-IP addresses. Click “Save” once all client-IP addresses have been verified. The clients in this case are Avi Vantage Controllers and Service Engines and the generated client certificates need to be registered with the SafeNet appliances for purposes of mutual authentication. This can be done directly per steps 3 and 4 below or by sending the client certificates to the concerned security team managing the HSM appliances. Icon next to the "Edit" icon leads to a page which allows the user to download generated certificates. After download, save the certificate as .pem. In this example, the certificate needs to be saved as 10.160.100.220.pem before scp to HSM. Register the client on the HSM. Luna SA 5.4.7-1 Command Line Shell - Copyright (c) 2001-2014 SafeNet, Inc. All rights reserved. Perform the above steps (1) and (2) for all HSM devices.The next steps must only be performed after all client certificates are registered on all HSM appliances configured above to verify the registration. First ensure the (partition) password is populated in the HSM group by editing the same. On the Avi Controller bash shell, the application ID must be opened before the Avi SE can communicate with the HSM. This can be done using the following command, which will automatically be replicated to each Avi Controller in the cluster. In case HSM groups were created in different tenants, safenet.py scripts can take an optional argument -t . Alternately the default ‘admin’ tenant can be provided as the argument value.Verify that the application ID can be opened successfully per output below. username@avi:~$ /opt/avi/scripts/safenet.py -p [HSM-GROUP] -i [CLIENT IP OF CONTROLLER REGISTERED WITH HSM] -t [TENANT_NAME] —c "/etc/luna/bin/sautil -v -s 1 -i 1792:1793 -o -p my_partition_password"
Copyright (C) 2009 SafeNet, Inc. All rights reserved. program in whole or in part is a violation of the license agreement. Will use application ID [1792:1793]. HSM Slot Number is 1.
closed or until the access is explicitly closed. Note: In the step above, if an error message appears stating that the application is already open, you can close it using the following command. After closing it, reopen the application. username@avi:~$ /opt/avi/scripts/safenet.py -p [HSM-GROUP] -i [CLIENT IP OF CONTROLLER REGISTERED WITH HSM] -t [TENANT_NAME] —c "/etc/luna/bin/sautil -v -s 1 -i 1792:1793 -c -p my_partition_password"
Starting with 16.3.2, Avi Vantage automates configuration of HA across HSM devices. Before configuring HA, ensure that the clients are registered with the HSM using listSlots command. This command provides details about the HSM devices to be set up. The serial number provided in the output of this command is needed to set up HA across these devices. Verify that the partition serial numbers listed below match the ones set up on the SafeNet appliances or the ones provided by the security team. This should also match with the configuration in the HSM group object. Internally, the serial number is used to configure HA if the client is registered on more than one partition on the HSM. More details about each of these commands can be found in the SafeNet documentation. username@avi:~$ /opt/avi/scripts/safenet.py -p [HSM-GROUP] -i [CLIENT IP OF CONTROLLER REGISTERED WITH HSM] -t [TENANT_NAME] -c "/usr/safenet/lunaclient/bin/vtl listSlots"
HA can be enabled from the CLI as follows after switching to the appropriate tenant if required. 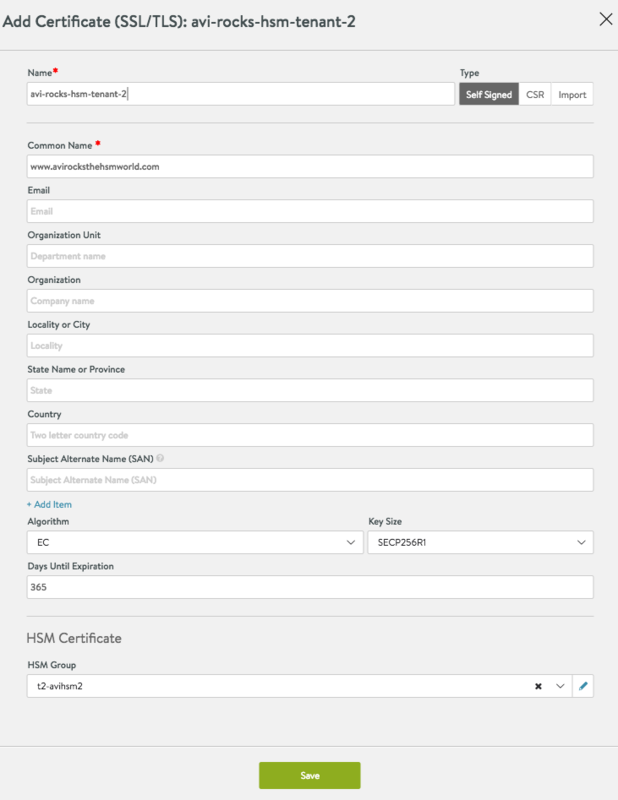 Alternatively, this can also be done in the web interface by selecting the HSM group and editing it to select the ‘Enable HA’ check box. This option is available only while editing the HSM group with more than one server. Once HA is set up, verify the output of the listSlots command to ensure the “avi_group” virtual card slot is configured. [username:avi]: /opt/avi/scripts/safenet.py -p [HSM-GROUP] -i [CLIENT IP OF CONTROLLER REGISTERED WITH HSM] -t [TENANT_NAME] -c "/usr/safenet/lunaclient/bin/vtl listSlots"
The HSM group must be added to the SE group that will be used by virtual service. Switch to appropriate tenant. Navigate to Infrastructure > Cloud > Default-Cloud > Service Engine Group. Bring up the SE group editor for the desired SE group. Click to the Advanced tab. Select the desired HSM group from the pulldown and click Save. 5.1 Create Application Certificate and Keys. The Controller is setup as a client of HSM and can be used to create keys and certificates on the HSM. Both the RSA and EC type of key/cert creation is supported. Use a browser to navigate to the Avi Controller’s management IP address. If Avi Vantage is deployed as a 3-node Controller cluster, navigate to the management IP address of the cluster. Use this procedure to create keys and certificates. The creation process is similar to any other key/certificate creation. For a key/certificate bound to HSM, select the HSM group while creating the object. The picture below illustrates the creation of self-signed certificate bound to a HSM group. 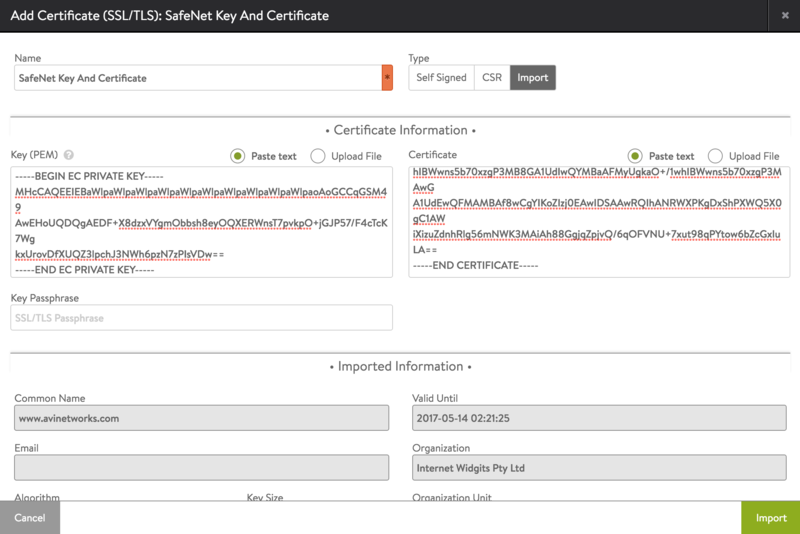 Navigate to Templates > Security > SSL/TLS Certificates, and click Create > Application Certificate. Note in the above picture, HSM Group t2-avihsm2 is selected. This is the HSM group that was created earlier. Clicking on the “Save” button creates the self-signed EC cert on HSM provided in t2-avihsm2. Use a browser to navigate to the Avi Controller’s management IP address. If Avi Vantage is deployed as a 3-node Controller cluster, navigate to the management IP address of the cluster. Use this procedure to import the private keys created using the SafeNet cmu/sautil utilities, and the associated certificates. Enter a name for the certificate definition. Prepare to import the private key for the server certificate. Above the Key field, in the Certificate Information section, select Paste text (to copy-and-paste the certificate text directly in the web interface) or Upload File. If the key file is secured by a passphrase, enter it in the Key Passphrase field. Paste the key file (if copy-and-pasting) or navigate to the location of the file (if uploading). Above the Certificate field, select Paste text or Upload File. Click Validate. Avi Vantage checks the key and certificate files to ensure they are valid. In the Controller web management interface, navigate to Applications > Virtual Services. If configuring a new virtual service, enter the name of the VIP. Select the HSM certificate from the SSL Certificate drop-down list. Enter the virtual service name and VIP address. In the Service Port section, enable SSL. Click Advanced. On the Advanced page, select the SE group to which the HSM group was added. The virtual service is now ready to handle SSL/TLS traffic using the encryption/decryption services of the SafeNet Network HSM device.